Home - Northwoods Canoe Co. Welcome to my company’s website! I hope that you easily find the information that you are looking for, but if not, please contact me at the shop. I do have some help in the shop from one or two highly skilled full-time and part-time staff members and we can all answer your questions! The Northwoods Canoe Company is located in Atkinson, Maine, where I have been developing hand-crafted wooden canoes for almost 40 years. My shop specializes in new wooden canoes, canoe kits, restoration services, and building materials. All of my new canoes and restorations are custom built. Over the years, my shop has developed a world-wide reputation for the highest quality and dependable work. 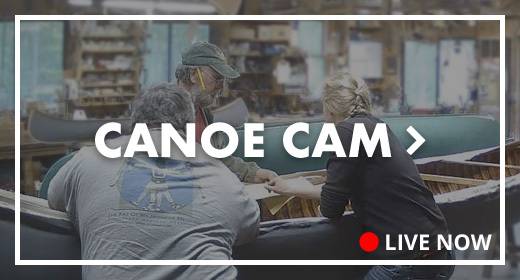 Please review the site for more information concerning the canoes, the shop’s history, our blog and the shopcam, which gives a snapshot of what’s going on in the shop every 10 seconds!